We all pretty much know that exercise has some amazing effect on our health.That should not come as a surprise. But how long and how hard do I have to train to get the best bang for my buck? If I put more hours into my training will this increase my longevity ? Regular exercise makes you live longer. Studies have shown that middle-aged people that start exercising for the first time live longer than our non-exercising friends. In fact it can lower the risk of death by 23% over the next 2 decades or so. And the beauty of it is that you don’t even need any athletic ability to get this effect on longevity. 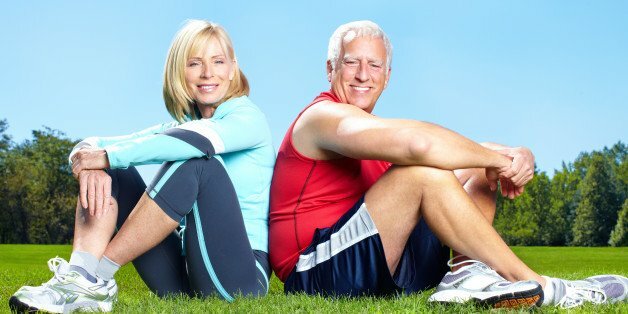 In fact your average computer nerd that takes up exercise in midlife will live longer than the college athlete who has stopped exercising all together. So how much extra time on earth will I buy with some extra hours of exercise? In a Harvard alumni study they examined mortality rates of more than 17000 men. They found out that life expectancy was about 2 years longer for those who expended 2000 calories per week on exercise. To put this in perspective: 2000 calories is around 20 km of jogging, or about 4 sessions in the gym. Yes it is, although there is a limit. Jogging 15 km a week improves your life expectancy dramatically. Jogging 30-40 km a week lowers your risk of dying a bit more. However jogging over 40 km has seems to provide no extra benefits. Ralph Paffenbarger, one of the principal investigator in the studies summed this up in a cool little formula. For each hour that a person exercises, he/she would get roughly 2 extra hours of life. Do you live longer if you train harder? There is some evidence that you do but we have to be a bit skeptical about this. In the Harvard study, expanding more than 400 calories per week in intense exercise (jogging, swimming laps, tennis) was linked to reduced mortality.while spending 400 calories on light exercise (walking, gardening, working on the car etc) was not. Increasing the amount of intense exercise did extend the lifespan, but increasing the amount of light exercise did not make you live any longer. Now, intense (vigorous) exercise was defined as more than 6 METS (so six times greater than your resting metabolic rate), this is about 40-50 percent of your VO2Max. Now if you are not familiar with these definitions: this is an intensity at which you can still hold a conversation. Far from the killer workouts some of us do. A German study suggests that endurance capacity is the decisive factor associated with decreased mortality. Since intensity has more impact on endurance than pure volume. It seems that high intensity exercise has a small but nonetheless significant effect on mortality. Even though we haven’t completely figured out the key to immortality, we do know that it pays off to test yourself and push yourself. 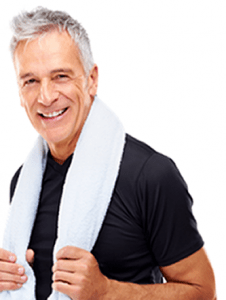 only a few hours of exercise a week can increase your longevity by years. So why not spend of few extra hours in the gym. Not only will you live longer but I guarantee you will live happier. 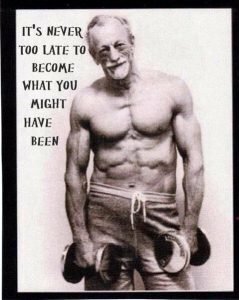 Its never to late to become what you might have been.